Louis XVI, King of France, was the son of Louis, dauphin of France, the son of Louis XV, and of Marie Joseph of Saxony, and was born at Versailles on the 23rd of August 1754, being baptized as Louis Augustus. His father's death in 1765 made him heir to the throne, and in 1770 he was married to Marie Antoinette, daughter of the empress Maria Theresa. He was just twenty years old when the death of his grandfather on the 10th of May 1774 placed him on the throne. He began his reign under good auspices, with Turgot, the greatest living French statesman, in charge of the disorganized finances; but in less than two years he had yielded to the demand of the vested interests attacked by Turgot's reforms, and dismissed him. Turgot's successor, Necker, however, continued the regime of reform until 1781, and it was only with Necker's dismissal that the period of reaction began. Marie Antoinette then obtained that ascendancy over her husband which was partly responsible for the extravagance of the ministry of Calonne, and brought on the Revolution by the resulting financial embarrassment. The third part of his reign began with the meeting of the states-general on the 4th of May 1789, which marked the opening of the Revolution. The revolt of Paris and the taking of the Bastille on the 14th of July were its results. The suspicion, not without justification, of a second attempt at a coup d'état led on the 6th of October to the "capture" of the king and royal family at Versailles by a mob from Paris, and their transference to the Tuileries. In spite of the growing radicalism of the clubs, however, loyalty to the king remained surprisingly strong. When he swore to maintain the constitution, then in progress of construction, at the festival of the federation on the 14th of July 1790, he was at the height of his popularity. Even his attempted flight on the 20th of June 1791 did not entirely turn the nation against him, although he left documents which proved his opposition to the whole Revolution. Arrested at Varennes, and brought back to Paris, he was maintained as a constitutional king, and took his oath on the 13th of September 1791. But already a party was forming in Paris which demanded his deposition. This first became noticeable in connection with the affair of the Champ de Mars on the 17th of July 1791. Crushed for a time the party gained strength through the winter of 1791-92. The declaration of war against the emperor Francis II, nephew of Marie Antoinette, was forced upon the king by those who wished to discredit him by failure, or to compel him to declare himself openly an enemy to the Revolution. Their policy proved effective. The failure of the war, which intensified popular hatred of the Austrian queen, involved the king; and the invasion of the Tuileries on the 20th of June 1792 was but the prelude to the conspiracy which resulted, on the 10th of August, in the capture of the palace and the "suspension" of royalty by the Legislative Assembly until the convocation of a national convention in September. On the 21st of September 1792 the Convention declared royalty abolished, and in January it tried the king for his treason against the nation, and condemned him to death. He was executed on the 21st of January 1793. Louis XVI was weak in character and mentally dull. His courage and dignity during his trial and on the scaffold has left him a better reputation than he deserves. His diary shows how little he understood, or cared for, the business of a king. Days on which he had not shot anything at the hunt were blank days for him. The entry on the 14th of July 1789 was "nothing"! The greater part of his time was spent hunting. He also amused himself making locks, and a little at masonry. Awkward and uncourtly, at heart shy, he was but a poor figurehead for the stately court of France. At first he did not care for Marie Antoinette, but after he came under her influence, her thoughtless conduct compromised him, and it was largely she who encouraged him in underhand opposition to the Revolution while he pretended to accept it. The only point on which he had of his own initiative shown a strong objection to revolutionary measures was in the matter of the civil constitution of the clergy. A devoted and sincere Roman Catholic, he refused at first to sanction a constitution for the church in France without the pope's approval, and after he had been compelled to allow the constitution to become law he resolved to oppose the Revolution definitely by intrigues. His policy was both feeble and false. He was singularly unfortunate even when he gave in, delaying his acquiescence until it had the air of a surrender. 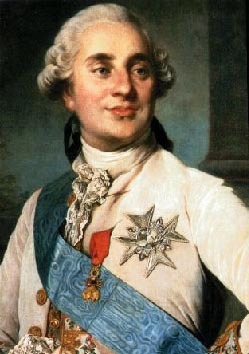 It is often said that Louis XVI was the victim of the faults of his predecessors. He was also the victim of his own. Having lost his elder son in 1789 Louis left two children, Louis Charles, usually known as Louis XVII (the dauphin, a king in title only), and Marie Thérèse Charlotte (1778-1851), who married her cousin, Louis, duke of Angoulême, son of Charles X, in 1799. The "orphan of the Temple", as the princess was called, was in prison for three years, during which time she remained ignorant of the fate which had befallen her parents. She died on the 19th of October 1851.